Get ready for your debut on the catwalk—with a little help from your cat! To commemorate the launch of its 100 percent recyclable cat-littler bag, Yesterday’s News is asking planet-conscious cat lovers to design a one-of-a-kind handbag using elements from its new packaging. The Do-Gooder Design Challenge requires zero sewing skills, however. You can create your bag virtually using the online Bag Builder, which allows you to drag, drop, and edit your choice of patterns, colors, shapes, and embellishments. Besides submitting their designs, contest entrants must also dash off a short essay (100 words or less) on how they “do good” every day for their kitty, home, or environment. 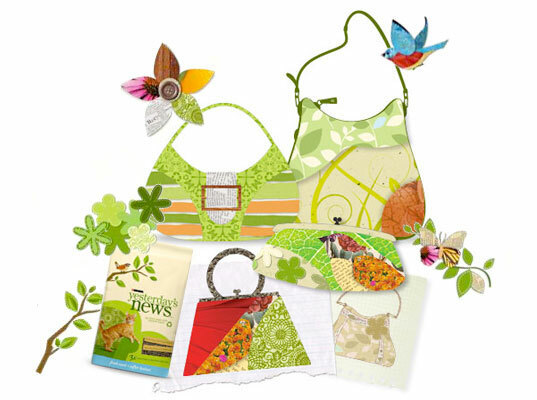 Not only will the three grand-prize winners see their designs transformed from Yesterday’s News bags into actual handbags—by an eco-friendly bag designer, no less—but they’ll also win a trip to New York City to the first-ever Yesterday’s News Green Catwalk and Workshop event this fall. Three grand-prize winners will see their designers transformed into actual handbags. The cat-litter company, which uses recycled paper and sawdust in its products, will also be unveiling recycled-newspaper fashions from five leading eco-designers: Lara Miller, Bahar Shahpar, Samantha Pleet, Nahui Ollin, and Restore Clothing. In addition, the event will feature eco-living workshops by green expert/cat owner Renee Loux. Get ready for your debut on the catwalk�with a little help from your cat! To commemorate the launch of its 100 percent recyclable cat-littler bag, Yesterday's News is asking planet-conscious cat lovers to design a one-of-a-kind handbag using elements from its new packaging. The Do-Gooder Design Challenge requires zero sewing skills, however. You can create your bag virtually using the online Bag Builder, which allows you to drag, drop, and edit your choice of patterns, colors, shapes, and embellishments.